This is a scalable context timeline. It contains events related to the event April 24, 1997: McVeigh Trial Opens. You can narrow or broaden the context of this timeline by adjusting the zoom level. The lower the scale, the more relevant the items on average will be, while the higher the scale, the less relevant the items, on average, will be. 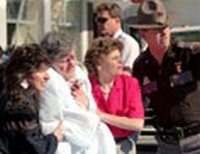 Jennifer McVeigh, the sister of Oklahoma City bomber Timothy McVeigh (see 8:35 a.m. - 9:02 a.m. April 19, 1995), will later testify that during this time, her brother gives her a “wad” of cash and asks her to “launder” it for him. He claims the money comes from a bank robbery. She will also testify that her brother discusses plans to conduct political assassinations. Later investigations will show that by this time Timothy McVeigh may be involved with a self-described “terrorist group,” the Aryan Republican Army (see 1992 - 1995), which has staged numerous robberies and says its purpose is to conduct “terrorist acts against the United States.” [Nicole Nichols, 2003] McVeigh comes back to their Pendleton, New York, home in the days after their grandfather dies (see November 2-7, 1994), and stays for a month. He shows his sister a videotape about the Branch Davidian debacle (see April 19, 1993 and April 19, 1993 and After), and tells her he believes the FBI and the Bureau of Alcohol, Tobacco and Firearms (BATF) were responsible for the deaths at the Davidian compound. He also says he does not believe the government will ever hold anyone accountable for the deaths. Letter to BATF - McVeigh’s second letter, written to the BATF and labeled “ATF Read,” is even more alarming. It reads in part: “ATF, all you tyrannical motherf_ckers will swing in the wind one day for your treasonous actions against the Constitution and the United States. Remember the Nuremburg War Trials. But… but… but… I was only following orders.… Die, you spineless cowardice [sic] b_stards!” He prints the American Legion letter for mailing, but leaves the ATF letter in the computer, apparently for federal agents to find after he has launched his bombing attack. [New York Times, 5/6/1997; Serrano, 1998, pp. 114-115] Jennifer will write her own letter to her hometown newspaper warning of an impending government crackdown on its citizens’ liberties (see March 9, 1995), a letter which will echo many of her brother’s anti-government sentiments. Timothy McVeigh, preparing to execute the Oklahoma City bombing (see 8:35 a.m. - 9:02 a.m. April 19, 1995), tells his friend and fellow co-conspirator Terry Nichols (see April 16-17, 1995), “Something big is going to happen.” McVeigh had mailed two letters to his sister Jennifer (see March 9, 1995 and April 7, 1995) telling her that “something big is going to happen,” and followed them with an envelope full of clippings from the novel The Turner Diaries (see 1978). When she learns of her brother’s arrest in connection with the bombing, she will burn the clippings. [New York Times, 4/26/1995; New York Times, 5/7/1997; Anti-Defamation League, 2005] Press reports will say that Jennifer in turn has already told friends in December 1994 that “something big is going to happen in March or April, and Tim’s involved” (see Mid-December 1994), but she will deny saying this. [New York Times, 8/4/1995] This information will later be included in an affidavit accompanying an arrest warrant for Nichols (see April 25, 1995). 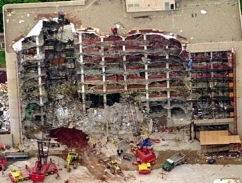 The FBI says that evidence compiled on the Oklahoma City bombing shows that it was planned for months by accused bomber Timothy McVeigh (see 8:35 a.m. - 9:02 a.m. April 19, 1995 and April 21, 1995) and a small number of co-conspirators. The statement by the FBI echoes statements made earlier by Attorney General Janet Reno (see April 22, 1995). Evidence shows that McVeigh was driven in part by his rage at the government’s handling of the Branch Davidian standoff two years earlier (see April 19, 1993). McVeigh has refused to cooperate with investigators, and reportedly has shown no remorse or emotion of any kind, even when confronted with photographs of dead and maimed children being taken from the devasted Murrah Federal Building. 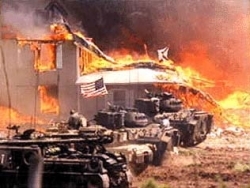 The attack was timed to coincide with the Branch Davidian conflagration of April 19, 1993, investigators say, and was executed after months of planning, preparation, and testing. 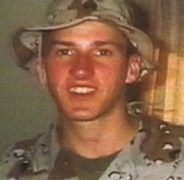 Some investigators believe that McVeigh may lack the leadership skills to plan and execute such a plot, and theorize that the ringleader of the conspiracy may turn out to be someone else (see April 21, 1995 and After). Evidence collected from the Ryder truck, particularly shards of blue plastic from barrels containing the fertilizer and fuel oil that comprised most of the bomb’s elements, point to the involvement of Terry Nichols, a friend of McVeigh’s who is coming under increasing scrutiny as a possible co-conspirator (see 3:15 p.m. and After, April 21-22, 1995). Similar barrels were found in Nichols’s garage in his Herington, Kansas, home (see (February 20, 1995)), along with other evidence tying him to the bomb’s construction. Investigating Possible Involvement of Sister - Investigators are in the process of searching the home of McVeigh’s younger sister Jennifer, who has returned from a vacation in Pensacola, Florida (see April 7, 1995 and April 21-23, 1995). They are also poring over Jennifer McVeigh’s 1995 Chevrolet pickup truck, registered in New York. Investigators say the two siblings are very close, share similar anti-government views (see March 9, 1995), and have had numerous conversations in recent months (see Mid-December 1994). Jennifer McVeigh is taken into federal custody as well, as a witness, not as a suspect, and is released on April 25, after an intensive interrogation session that leaves her frightened and angry. “They told me Tim was guilty,” she will later recall, “and that he was going to fry.” According to her recollections, the agents threaten to charge her as a co-conspirator unless she gives them evidence against her brother, but she refuses to cooperate. She does reveal some information about her brother’s involvement in gun dealing, his strong belief in the US Constitution as he and right-wing white separatist groups interpret it, and his obsession with the violently racist novel The Turner Diaries (see 1978). “He had people he knew around the country,” she tells agents, mentioning three: “Mike and Lori and Terry.” Terry is Terry Nichols. “Mike and Lori” are McVeigh’s close friends Michael and Lori Fortier (see May-September 1993, February - July 1994, August 1994, September 13, 1994, October 21 or 22, 1994, April 19, 1995 and After, and December 16, 1994 and After). She tells them about watching anti-government videotapes with her brother, in particular one called “Day 51” about the Waco siege. “It depicted the government raiding the compound, and it implied that the government gassed and burned the people inside intentionally and attacked the people,” she tells the agents. “He was very angry. I think he thought the government murdered the people there, basically gassed and burned them down.” The agents ask if by the government, he meant the FBI and the ATF (Bureau of Alcohol, Tobacco and Firearms, also abbreviated BATF). “He felt that someone should be held accountable,” she answers, and says her brother believed no one ever had been held responsible. She shows them the “ATF Read” letter he had written on her word processor (see November 1994) that concludes with the exhortation, “Die, you spineless cowardice [sic] b_stards!” She says that McVeigh had told her he had moved out of a “planning” stage into an “action” stage, though he never explained to her exactly what “action” he intended to take. Later, she will sign a statement detailing what her brother had told her. She will always insist that he never spoke to her about ammonium nitrate, anhydrous hydrazine, or any of the chemical components of the bomb, and had never spoken to her about the scene in The Turner Diaries that depicts the FBI building in Washington being obliterated by a truck bomb similar to the one used in Oklahoma City. The FBI seizes a number of her belongings, including samples of her antigovernment “patriot” literature. But, they determine, Jennifer McVeigh was never a part of her brother’s conspiracy. According to an analysis by the New York Times, many questions remain unanswered in the aftermath of the conviction and death sentence of Oklahoma City bomber Timothy McVeigh (see June 2, 1997 and June 11-13, 1997). Who, if anyone, helped McVeigh assemble the bomb? Did McVeigh receive help from co-conspirator Terry Nichols alone (see 5:00 a.m. April 18, 1995 and 8:15 a.m. and After, April 18, 1995), or did he receive help from his friends in the militia and white supremacist movements (see (April 1) - April 18, 1995)? Was there a larger conspiracy that the McVeigh trial failed to uncover? In sentencing hearings, McVeigh’s lawyer Stephen Jones hinted at just such a conspiracy (see June 11-13, 1997), echoing assertions he and his fellow lawyers made during the trial—that McVeigh was part of a larger, shadowy conspiracy (see April 24, 1997). Jones asked jurors to spare McVeigh’s life in the hope that McVeigh may at some future date reveal the details of that alleged conspiracy, saying: “The chapter—the book of the Oklahoma City bombing—is not closed. Do not close it. Do not permit others to close it. Let there be a full accounting, not a partial accounting.” Prosecutor Joseph H. Hartzler chose from the outset to focus strictly on McVeigh and eschew attempting to prove the existence of a possible conspiracy. While Jones and his fellow lawyers were not allowed to present what they called evidence of a “global” conspiracy involving McVeigh, Jones’s media comments, including one assertion that both McVeigh’s co-conspirators and the federal government want McVeigh executed to keep him quiet, are fueling conspiracy theories among right-wing militia groups. Within the Justice Department, many argued that McVeigh may well have been part of just such a conspiracy, though evidence of that conspiracy was thin at best and the department is not conducting an investigation into any such possibility. It is possible that the upcoming trial of Nichols may shed more light on the issue. [New York Times, 6/15/1997] Oklahoma Representative Charles R. Key (R-Oklahoma City) wants McVeigh to face a state trial before his execution in order to explore his theory that the government covered up evidence of a conspiracy, and even that government officials knew the bombing was coming and did nothing to stop it. Key has succeeded in having a district judge order the empaneling of a grand jury to look into his allegations. Key’s lawyer, Mark Sanford, tells a local reporter that he hopes the grand jury will identify the notorious “John Doe No. 2” (see April 15, 1995, April 18, 1995, April 20, 1995, April 21, 1995, April 29, 1995, and June 14, 1995), saying: “I am glad someone is going to start looking into the investigation the federal jury never got into. Maybe we will get some answers. We know there is a John Doe No. 2. We have to get everybody who participated. They all have to be punished for what they did.” [New York Times, 6/15/1997] Key is involved with right-wing militia groups (see July 17, 1998).